Home » Blog » Word » History » Do you know…how KT-22 got its name? “I was scared to death. It was almost vertical. 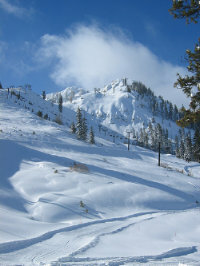 I thought I’d have to stay until spring,” recalls Sandy Poulsen, early Squaw pioneer. While she and husband Wayne were skiing the resort in 1948, Sandy was terrified and couldn’t link a turn down the steep north face of one of the resort’s infamous peaks. Instead she would traverse the slope, make a kick turn and do it again and again and again. Patiently waiting at the bottom, Wayne counted 22 kick turns. In her honor, he named the mountain KT-22 and it’s been a challenge for many til this day, not just Sandy. Sandy and Wayne Poulsen were truly the first couple of Squaw Valley. They were the first family to build a year-round home there and they raised 8 kids – 4 of them made it on to the U.S. Ski Team. For a short stint, they were parters in the resort with Alex Cushing, but soon broke that off focusing on real estate instead. They also owned and operated a ski operation called Papoose which is adjacent to the Red Dog chairlift. A remarkable woman with class and a dogged determination to live in the mountains and raise a family to enjoy a remarkable life, Sandy passed away in September after a long battle with cancer. 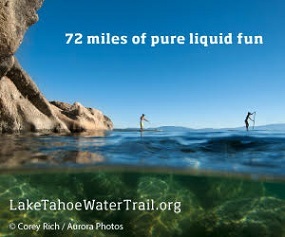 Photo from unofficialsquaw.com See more photos here.